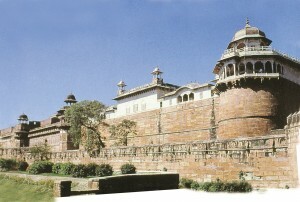 The construction of the Agra Fort was started around 1565 when Akbar built the initial structures. Shah Jahan replaced most of these with his marble creations some however survived, among them are – Delhi Gate, Amar Singh Gate, Akbar Mahal and the Jahangiri Mahal. The fort is crescent-shaped, flattened on the east with a long, nearly straight wall facing the river. It has a total perimeter of 2.4 Km, and is ringed by double castellated ramparts of red sandstone punctuated at regular intervals by bastions. A 9 mts. wide and 10 mts. deep moat surrounds the outer wall. An imposing 22 mts. high inner wall imparts a feeling of invincible defensive construction. The route through the Amar Singh Gate is doglegged. The layout of the fort was determined by the course of the river, which in those days flowed alongside. The main axis is parallel to the river and the walls bridge out towards the city. The fort had originally four gates, two of which were later walled up. * A delegate in the west is fortified by massive octagonal towers and faces the bazaar and leads to the Jama Masjid in the city. Its architectural plan was imperviously devised to put the defenders in an advantageous position. * The Amer Singh Gate lies to the south and is defended by a square bastion flanked by round towers. It had a crooked entrance with a dangerous trap point and a step rise. Its Naubat Khana Court with pillared pavilion is an impressive structure. Jahangiri Mahal: This is the first notable building that the visitors sees on its right hand sides at the end of a spacious lawn, as one entry through the Amar Singh Gate and emerges out of the passage. It is built of stone and is simply decorated on the exterior. The most important feature of the edifice is its ornamental stone brackets, which support the beams. In fort is a large stone bowl, which was probably used to contain fragrant rose water. Jahangir has carved ornamental Persian verses along the outer rim, which record its construction in 1611 A.D. This elegant, double storeyed building palace reflects a strong Hindu influence with protruding balconies and dome chhatris. Jodha Bai’s Palace: To the right of Jahangiri Mahal is Akbar’s favourite queen Jodha Bai’s Palace. In contrast to other palaces in the fort, it is rather simple. Through the silts in the wall one can see the Taj. A better place to take photographs is further on. Anguru Bagh: These formal, 85 mts. sq., geometric gardens lie to the left of the fort. During Shah Jahan’s time decorative flowerbeds considerably enhanced the beauty of the gardens. Golden Pavilion: The curved chala roofs of the small pavilions by the Khaas Mahal are based on the roof shaped of Bengali village huts constructed out of curved bamboo, designed to keep off heavy rain. The Sultans of Bengal first expressed the shape in stone. Originally glided, these were probably ladies’ bedrooms, with hiding places for jewellery in the walls. These pavilions are traditionally associated with Shah Jagan’s daughters – Roshanara and Jahanara Begum. Khaas Mahal: Situated in between the Golden Pavilion is the Khaas Mahal. Built internally of marble of Shah Jahan, the palace demonstrates distinctive Islamic – Persian features. These are well blended with a striking range of Hindu features such as Chhatris. It is considered to be emperor’s sleeping room or ‘Aramgha’. The Khaas Mahal provides the most successful example of painting on a white marble surface. Musamman Burj: On the left of the Khaas Mahal is the Musamman Burj built by Shah Jahan. It is a beautiful octagonal tower with an open pavilion. With its openness, elevation and benefit of cool evening breezes blowing in off the Yamuna River. This is where Shah Jahan lay on his deathbed, gazing at the Taj. Access to this tower is a through a magnificently decorated and intimate apartment with a scalloped fountain in the centre. The inlay work here is exquisite, especially above the pillars. In front of the fountain is a sunken courtyard, which could be flooded, and in the Sheesh Mahal opposite are further examples of decorative water engineering in the hammams. Sheesh Mahal: Opposite to the Musamman Burj and just below the Diwan-i-Khaas hall is the Sheesh Mahal or the Glass Palace. It is believed to have been the harem dressing room and its walls are inlaid with tiny mirrors, which are the best specimens of glass – mosaic decoration in India. The Sheesh Mahal is composed of two large halls of equal size, each measuring 11.5 mts. by 6.40 mts. Both are connected in the centre by a broad arched opening and on the sides by two narrow passages. Diwan-i-Khaas: To the right of Sheesh Mahal is Diwan-i-Khaas, the hall of Private Auditions. Presently entry is not allowed inside Diwan-i-Khaas but the fine proportions of the building can easily appreciated. The marble pillars are inlaid with semi-precious stones in delightful floral patterns. Hammam-i-Shahi: To the right of Diwan-i-Khaas is the Hammam-i-Shahi or the Shah Burj. Foreign travellers who visited Agra during the reigns of Jahangir and Shah Jahan have described this apartment as the Ghusal Khana (bathroom). It was not the Turkish bathroom as it generally but erroneously supposed. It was really an “air-conditioned” apartment, attached to the residential quarters and was used as a summer retreat. Business of very confidential nature was conducted here. Macchhi Bhawan: Opposite to the Diwan-i-Khaas is the Macchhi Bhawan, the Fish Enclosure. The Emperor sat on the white marble platform facing the Enclosure. It ones contained pools and marble fountain, which were carried off by Jat Raja Suraj Mal to his palace at Deeg. Around the Macchhi Bhawan were the imperial offices. Diwan-i-Am: In front of the Macchhi Bhawan is Diwan-i-Am. One can approach it by going down an internal staircase. The clever positioning of the pillars gives the visitors, arriving through the gate in the right and left hand walls of the courtyard, an uninterrupted view of the throne. On the back wall of the pavilion are jail screen the throne alcove is of richly decorated white marble. It uses to house the Peacock Throne. When Shah Jahan moves his capital to Delhi, it was taken to the Red Fort. Nagina Masjid: From the corner opposite to Diwan-i-Khaas two doorways lead to a view over the small courtyard of the Zenana. Further round in the next corner is the Nagina Masjid. Shoes must be removed at the doorways. Built by Shah Jahan, this was the private mosque of the ladies of the court. Beneath it was Mina Bazaar for the ladies to make purchases from the marble balcony above. Moti Masjid: To the right of the Diwan-i-Am, one can see the dome of the Moti Masjid (Pearl Mosque), the prettiest structure at Agra Fort. Mina Masjid: Just above the Sheesh Mahal apartment is situated the Mina Masjid, which seems to have been constructed by Shah Jahan for strictly private use. The Mina Masjid is enclosed on all side by high wall. The marble mosque has three small arches in its façade, which are plain and unadorned. The most important feature in this palace-mosque is the small chhajja above the arcade, which is supported on four exquisitely carved and molded small brackets of white marble. Radhaswami Temple: It is located 9 km from Agra Fort. Soamibagh houses the samadhi of the founder of Radh Swami faith, ‘Swami Maharaj’. The main structure is a majestic building, 110 ft. in height, built of pure white marble. The most impressive features of the samadhi are the detail and exquisite carvings on the walls, arches and pillar capitals. The belief here is that construction work should never end, making it into a ‘living monument’ for work is going on incessantly since 1904. This entry was posted in Agra Fort, Uttar Pradesh and tagged Historical Place. Bookmark the permalink.